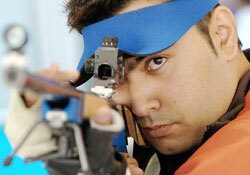 India’s Abhinav Bindra won a gold in men’s 10-metre Air Rifle event in Beijing. Bindra shot 104.5 to take his total to 700.5 in the final. This is India’s first ever Olympic gold in any individual event and ninth in total. In ten rounds, Bindra shot 10.7, 10.3, 10.4, 10.5, 10.5, 10.5, 10.6, 10.0, 10.2, 10.8 to clinch the first berth. China’s Qinan Zhu won silver while Finland’s Henri Hakkinen won bronze. Bindra had shot a total of 596 out of 600, shooting a perfect 100 in 3 of the 6 rounds of the qualifiers. Bindra finished 4th to qualify 2 points behind Henri Hakkinen of Finland. Gagan Narang, meanwhile, was very unlucky missing out by just 1 point on a countback after he was tied with 4 others after 6 rounds with an average score of 9.917 in the qualifiers. In a countback, since all five shooters, who were tied, had shot a perfect 100 in the last round, the 5th round scores were taken into account, where Narang had managed a 98, whereas the others had shot either a 99 or a 100. If Narang had shot a 99 instead of a 98, 4th round scores would have been taken into account and Narang would have gone through. Ø The official Olympic Games flag was introduced in 1920, at the Games played in Belgium. Ø The key word “amateur” was eliminated from the Olympic Charter in 1971. Ø The immediate site of the ancient Olympiads, the Stadium of Olympia, was about 643 feet in length and about 97 feet wide. Ø The first Winter Olympics Games were open in Chamonix, France, on January 25, 1924. Ø The first Olympic games were held in Ancient Greece in 776 B.C. Ø The bow used by Olympic archers measures a maximum of 6 feet for men, 5¼ feet for women. Ø The balance beam used in Olympic gymnastic competition is 16 feet, 3 inches long and 4 inches wide. Ø Slovakia participated as an independent nation at the Olympic Games for the first time in Atlanta in 1996. Ø Olympic testing of athletes for anabolic steroids began in 1976. Ø Norway has won more total medals at the Winter Olympic Games than any other nation. Ø Micronesia made its Olympic Games debut at Sydney, Australia, in September 2000. Ø London has hosted the Olympic Summer Games twice, 1908 and 1948. Ø Korea marched under a single flag at the 27th Olympiad at Sydney, Australia, the first time in Olympic history. Ø Iranian women competed in the Olympics for the first time at the 1996 Atlanta Games. Ø In the opening procession of the Olympics, the team representing the host nation always marches last. Ø In 648 B.C., horses were first introduced into sports with the entrance of riders in the Olympic Games. Ø In 1912 in Stockholm, the first electric timing devices and public address system was used at the Olympics. Ø In 1896, only first and second place finishers of the Olympics were awarded medals. The winners received silver medals and crowns of olive branches, while second place finishers received bronze medals. Ø Because of the outbreak of major world wars, the modern Olympics did not hold competitions in 1916, 1940, and 1944. Ø When Australia won the right to host the Olympics in 2,000 it forced the homeless and poor out of Sydney, so rich overseas tourists would not have to look on poor people, and to hide from the world Australias shocking homeless problem. Ø Australian swimmer Murray Rose won six Olympic medals and was the first man to swim the 1,500-metre freestyle in less than 18 minutes. Ø At the 1952 Olympic Games, Russian gymnast Maria Gorokhovskaya won an overall record seven medals. Ø Beijing Olympics Broadcasting, the official broadcasting company will produce 5,400 hours of programs, 2,000 more than during the last Olympic Games in Athens. The ceremonies and events will reach an estimated audience of 4 billion people. Ø The Beijing Olympics will be the first to use high-definition technology for all its TV broadcasts. All events and ceremonies will be transmitted with 5.1 surround sound. Ø This will be the first time that the International Olympic Committee has sold separate broadcasting rights for television and new media such as internet and mobile technologies. Ø For the first time, one organizing committee (BOCOG) will handle both the Olympics and the Paralympics. 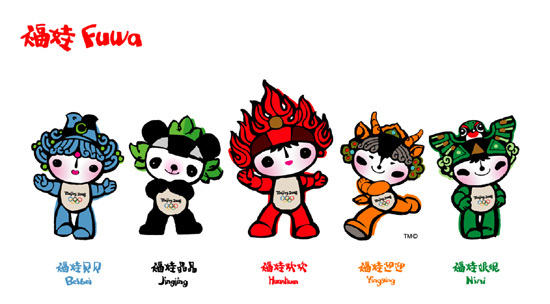 Ø The Beijing Olympics will cost 43 billion USD (about 27.5 billion euros). The cost of building venues amount to around 1.8 billion USD (1.15 billion euros). After the Games, the venues will be used as public sports and entertainment complexes. Ø Beijing has spent 16 billion USD (10.2 billion euros) in the last 10 years to improve air quality as well as build better transport infrastructure. The new T3, the world’s largest airport terminal, is one example. Fuwa also embody both the landscape and the dreams and aspirations of people from every part of the vast country of China. In their origins and their headpieces, you can see the five elements of nature — the sea, forest, fire, earth and sky — all stylistically rendered in ways that represent the deep traditional influences of Chinese folk art and ornamentation.